Four times I have had my nose pierced. In spite of the fact that it is long & hook shaped and has provided all its viewers with immense mirth – I have wanted a nose ring. I tried. FOUR TIMES. But things would go wrong and I’d have to give up the attempt and allow the nose piercing to close. 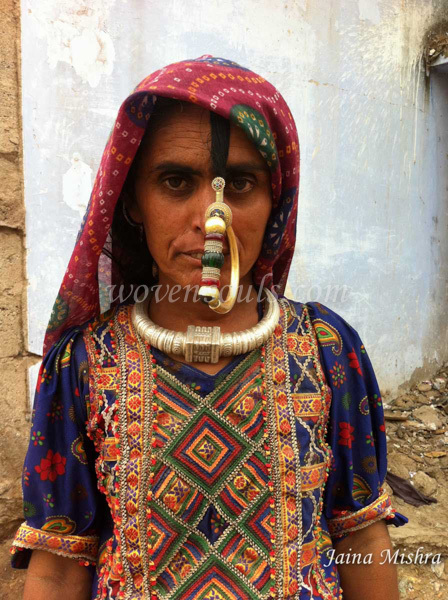 And so when I see these women with dramatic noserings I am filled with envy. Why them? Why not me? I met her in Bhuj on a trip in 2 years ago. Was on a mobike with my friend & guide in the market and upon seeing her and her family, we screeched and stopped and chatted with her and clicked her pictures on my phone camera. The piece – made in Gold – is heavy. And to ensure that the weight of her nose-ring does not convert her nose into one like mine, the tribe has a solution: A counterweight. Thisleaf shaped piece is tied to the nose ring with a thick cotton braid about 8 inches long, that goes over her skull and hangs at the back of her head under herOdhana or Head Shawl. This acts as a counterbalance in spite of which the piercing is quite large as seen in the picture. In India a woman has 16 ‘Shringar’ or ‘decoration’ items that are meant to be worn at all times once she is married. These adornements not only announces to the world that she is no longer available – but they also act as enticement devices for her husband. The nose ring is one of them. More has been written on this in the Payal or Anklet article. If only I could wear one 1/100the the size! My God… That nose ring is very scary.. 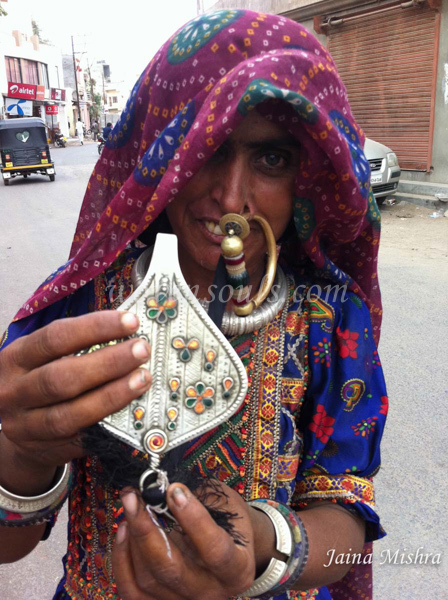 This entry was posted on May 1, 2014 by wovensouls in Culture Kaleidoscope and tagged art, Asia, bling, costume, cultural, dress, ethnic, gold, Jewellery, jewelry, journey, lifestyle, Nath, nose, nose ring, photo, ring, silver, tradition, traditional, Tribal, tribe, wovensouls.